There are times when all we want is to snuggle down in bed under our duvet. 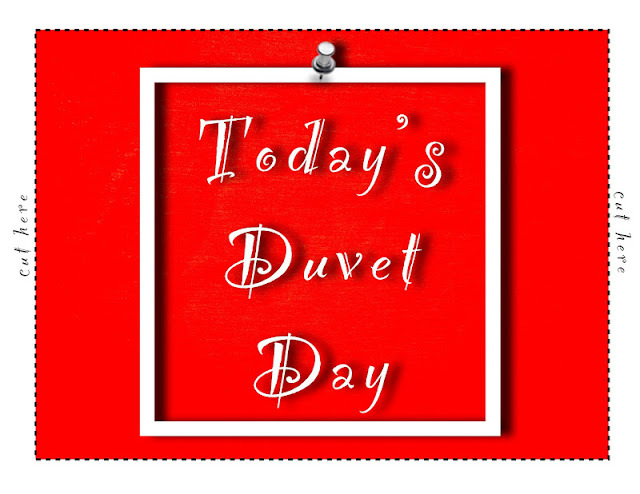 The British call this instinctual urge for self preservation a "Duvet Day." A Duvet Day is a day for hibernating. It's a day for not answering phone calls or emails. It's a day for taking splendid care of ourselves. In fact, it might be more than a day. If we are ill, or have suffered a great loss, we require a good many days for healing. While it is rare for me to lose my appetite, it has happened a couple of times. I found the experience terrifying, for without appetite my other grand passions also disappeared. Without desire, what are we? 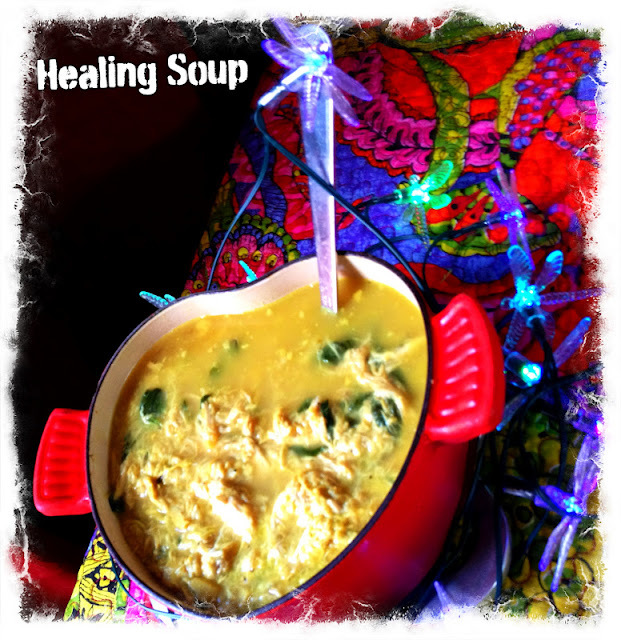 One of the ways I take care of myself, when feeling under the weather, is to make a big pot of healing soup. It's packed with everything required to boost immunity and reduce inflammation. It's also enormously versatile. Yes, it's a soup, but it becomes something else entirely when poured over a mound of mashed potatoes, pasta, or rice. 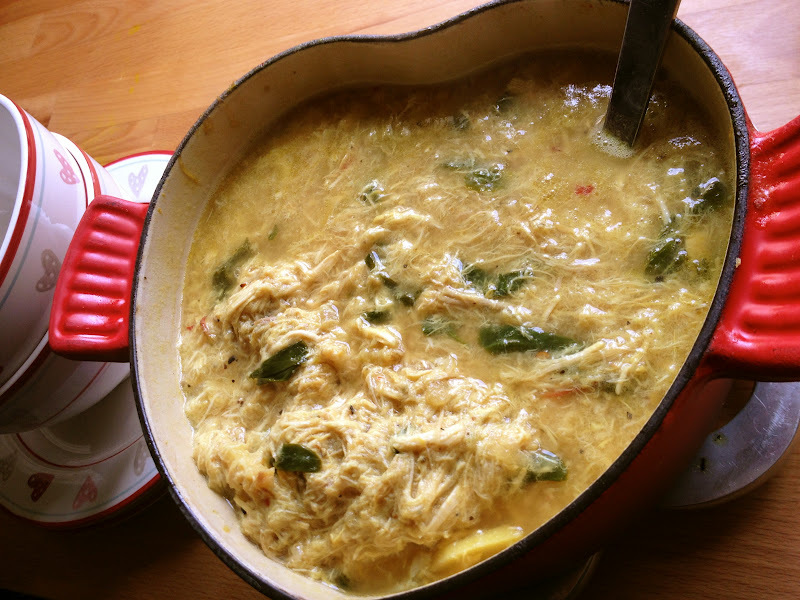 You can use it as a base for limitless meals like risotto, chicken pie, enchiladas, curry, and sandwiches. I'd go as far to say this is one of the most versatile things you can cook. This recipe makes a lot of soup. 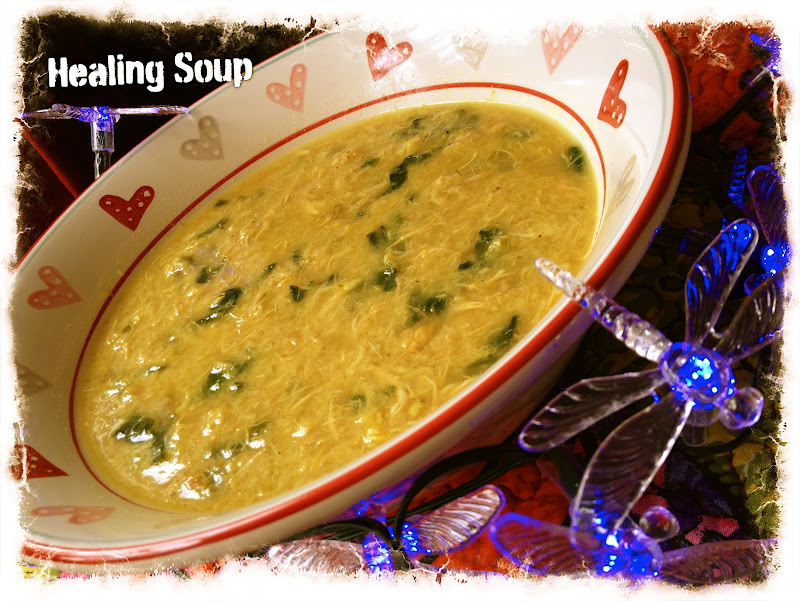 After removing bones, skin and fat, you will have approximately 4 liters of rich, golden stock and 2 kg of chicken. Cayenne or Chili Flakes - try a generous pinch of either, especially if you're experiencing any kind of upper respiratory problems. 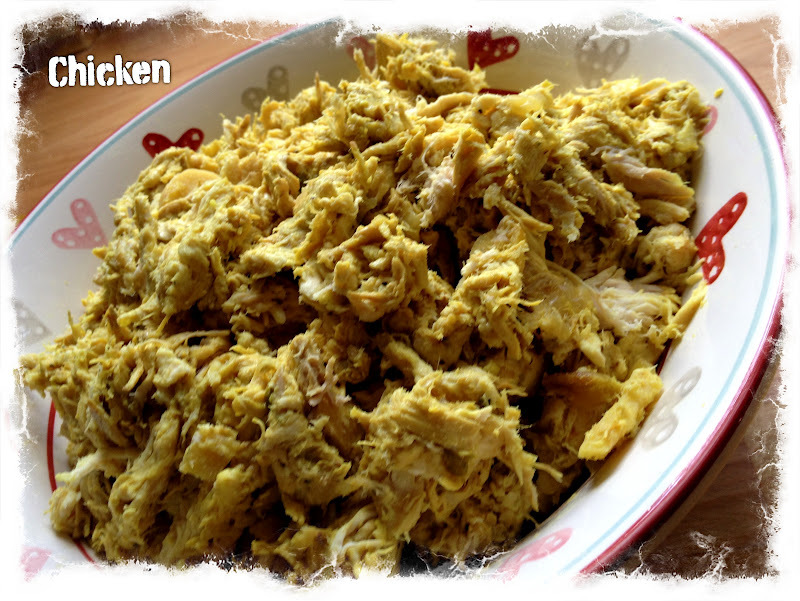 Chicken - 2 medium, approximately 1.5 kg each, or 3-1/2 lbs each. Total combined weight 3 - 4 kg, or 6 - 7 lbs. You can buy one big chicken, of course, but I find smaller chickens usually have more flavour. Dark Greens - I usually use a handful of chopped spinach or kale for each serving. Seasoning Notes: Even with all the flavour from the roots, herbs, seasoning, and chicken, this may be under-seasoned for those who like soup to pack a wallop. When making it for myself, I double up on the chili and turmeric. And if that's still not enough, I stir in some Thai chili paste. This really does help clear the lungs and nasal passages. Proceed with caution if you're not used to working with chili ingredients. A little goes a long way. And sometimes gentle soup is best. Pour olive oil in stock pot. Peel and finely chop two onions. Add onions to pot and caramelize over medium heat, stirring often. While onions are cooking, peel and grate ginger. Add to pot to cook with onions. Peel and chop garlic, add to pot. Wash, deseed and chop chillies, add to pot. Mix well. Juice the lemons and add juice to roots. Next, add apple juice, salt, pepper, turmeric, cayenne, sage, and chickens. No need to cut the chicken. They will break down as it simmers. 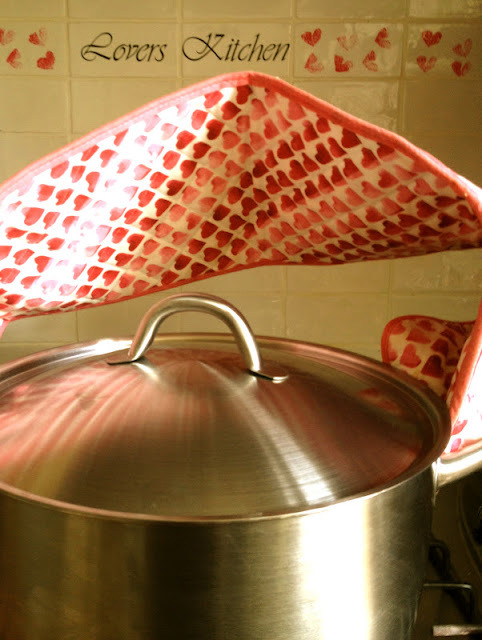 Add enough water to the pot to nearly cover chickens, without overflowing while they poach. Cover pot with lid and cook over medium heat for the first half hour, then lower heat to low setting and gently simmer for another two-and-a-half hours. Cooking at this low of heat, you should not need to replenish the water, but check every hour or so to make sure. After approximately three hours, turn off the heat and allow the chicken to rest in the pot, with the lid, on until cool enough to handle. This will take at least a couple of hours. When chicken is cool enough to easily touch, you will need to separate it from the stock and bones. Place a big colander into a second stockpot, or a very large container. Gently pour the soup, bones and all, into the colander, so that the second pot catches every drop of the delectable broth. You will likely have to do this in a couple of passes. Get out a couple more bowls to collect the bones and meat. Pick through the bones, removing all the meat, which will come apart easily in your hands. Toss bones and skin in one bowl and meat in the other. Refrigerate the broth, ideally overnight, or at least for several hours to allow the fat to rise to the top. When cold, skim the waxy layer of fat off the top and discard, or set aside the schmaltz (schmaltz is Yiddish for chicken fat) for making dumplings, or matzo balls, to add to your soup. 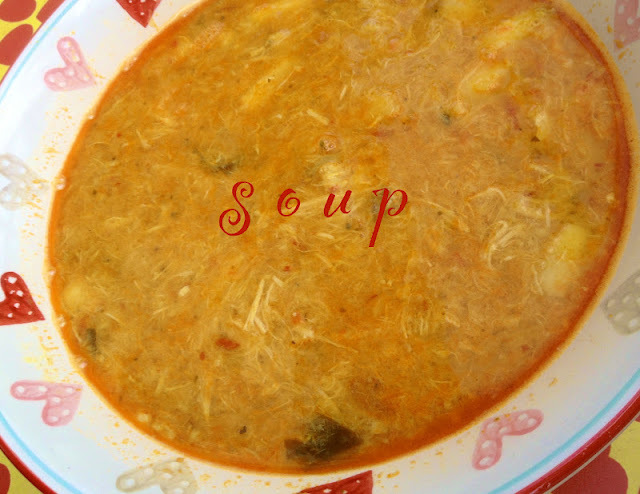 Refrigerate chicken separately, adding it to your soup, once it has been de-fatted. As the greens quickly break down when added to hot broth, toss them into the pot about five minutes before serving. They will add another colour and texture to your creation, not to mention even more nutrition. If you're not planning to eat your broth and chicken within a few days, freeze it. You will find it freezes very well. You can freeze the broth and chicken separately, or together. This is a wonderful meal to keep in the freezer when all you want is a quiet Duvet Day and a humble bowl of homemade chicken soup. Much as I love this soup, it's not my favourite chicken soup. It's my favourite healing food. I usually make Roasted Chicken Soup every week. That's my all time favourite soup. See the index for the recipe. I often save some broth for risotto (naturally there's a recipe for risotto too) This leaves lots of chicken for other uses. You could try your hand at making chicken Cornish pasties, stuffed peppers, or a plate of Bombay Meets Belfast Sandwiches. Usually, after a couple of days of healing soup, I'm eager to eat solids. If I haven't been too greedy with the chicken, I'll have enough left over for this super quick treat. Rather than eat it with rice, I like it slathered on Irish Barmbrack Bread. 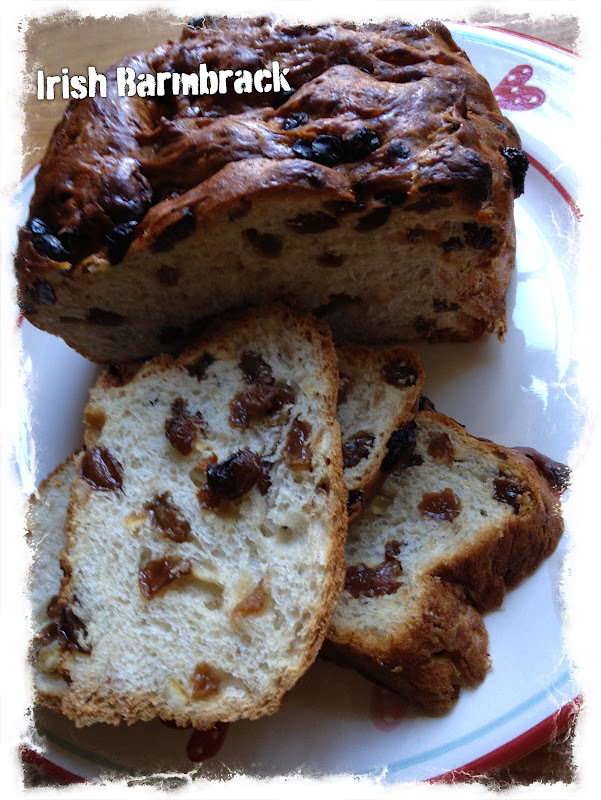 Barmbrack is a dense bread made with sultanas, ginger and mixed peel. If you can't find it, any dense, quality fruited, or fruit and nut bread works well. Save for the chicken, you use the exact same amount of these three ingredients: 330 g, or about 12 ounces, each of Spicy Mango Chutney, Chopped Pineapple and Slivered Almonds. Blend well. Add a couple of generous handfuls of chicken. Mix thoroughly with your hands. If it's too dry for your liking, add a bit of chicken broth. This works really well. Allow flavours to blend for at least an hour. Then spread generously on the toasted Barmbrack and eat open faced. When we don't feel well it is natural, even necessary, to turn inward. This is the time to give ourselves our full, loving attention. 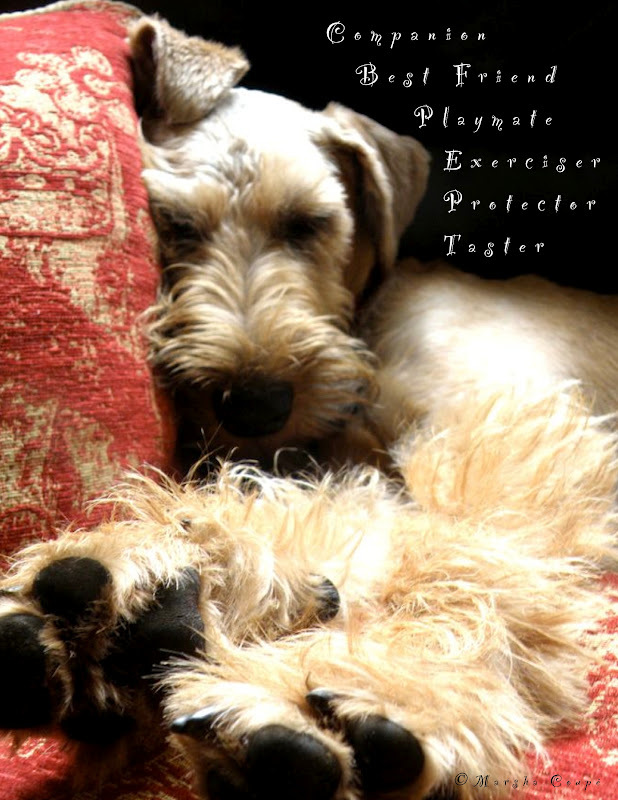 This is the time for snuggling up with your favourite pet(s) and a messy pile of books, magazines and catalogs; scenting your environment with essential oils such as lavender, rose, peppermint, eucalyptus, or Olbas Oil; drawing the curtains shut and lighting your room with fairy lights; hanging the Do Not Disturb Sign on your door, and silencing smart phones, pads, tablets, and computers. If you're congested or feel your lungs are compromised, before bathing or showering, fill your wash basin with very hot water and add several drops of Olbus, or Eucalyptus oil. 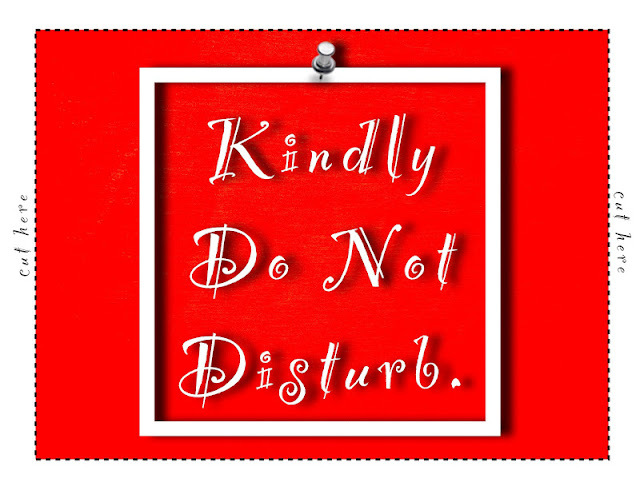 Make sure the window and door is firmly closed to allow the oils to work their magic, then indulge in a long, candlelit bath, or shower, inhaling deeply as you tenderly care for yourself. Let someone read you a story. There's a world of mesmerizing, professionally recorded audio stories for your aural pleasure. I make my own Duvet Day Playlists, featuring music and stories I want to listen to. This is a very comforting thing to do for yourself, and worlds more interesting than television. Explore the astonishing range of spoken word entertainment and thoughtful commentary on offer at BBC Radio 4. There's also BBC's Radio 4 Extra, if Radio 4 isn't offering what you're looking for, visit Sound Cloud, where along with JJ's audio sampler, you'll find hundreds of examples of spoken word entertainment. There's also Audible.com, National Public Radio and thousands of professional podcasts and digital radio stations. In well under a minute, you can find the best in Hawaiian music; take in a bit of French culture, live from Paris; eavesdrop on liberal Texan politics; get health tips from Germany's top naturopathic doctors; or listen to women Iranian artists discuss their work. Sometimes it's good to listen to people speaking a language we don't understand.